Click here to visit a selected portfolio of Richard Wastell's "We are making a new world" exhibition. 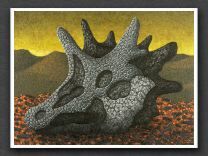 Click here to visit Richard Wastell's 2005 exhibition — "Not far from here"
Tasmanian artist Richard Wastell's sellout exhibition — "We are making a new world" — at Bett Gallery, North Hobart, was launched by bestselling author Richard Flanagan. This is an edited version of his launch speech. 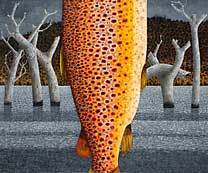 Cruel Tasmania, an island of secrets, threats, lies; of an often pitiless exploitation of both its own land and its own people, has wounded Richard Wastell into an extraordinary response — a series of beautiful paintings and drawings inspired by the ongoing clear-felling of Tasmania's old growth forests. For in Tasmania forest unlike any other in the world continues to be levelled to the ground to produce wood-chips. After being industrially logged, what remains is napalmed from the air to produce fires of such intense ferocity that the resultant fireballs resemble atomic cloud mushrooms. Into the plains of ash that are left are planted monocultural plantations, maintained by an intense regime of poisoning and fertilizing that has seen protected native animals killed in their hundreds of thousands, water supplies poisoned, and the spectre of a raft of illnesses draughting in the wake of these horrendous practices. To maintain such monstrosity, to evade the ever growing public anger, the woodchipping industry has had to exercise an ever stronger control over ever more aspects of Tasmanian life. Both major parties in Tasmania, and much of the Tasmanian media frequently give the appearance of existing only as a client of the woodchippers. State interest and those of this industry are now so thoroughly identified as identical that anyone questioning the woodchipping industry's actions is attacked by leading government figures as a traitor to Tasmania. And not only the forest has been destroyed by this industry. Its poison has seeped into every aspect of Tasmanian life: jobs are threatened, careers destroyed, people driven to leave. All this is background, but necessary background to these paintings. After firebombing, what was once forest is transformed into an extraordinary ruined landscape, which, if not of conventional sylvan beauty, still has about it a spectacular power rarely seen outside of the battlefields of great wars. 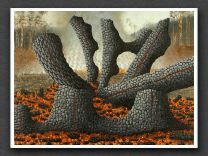 Parts of the Styx Valley, which has been the particular inspiration for these paintings, brings to mind images of Passchendale and the Somme, with their mud and ash and charred and twisted trees. Though they will have forever after in Tasmania an undeniably political dimension, these arc anything but political paintings. They are intensely spiritual paintings by a painter whose close technique becomes ever more capable of conveying an enormous emotion. And perhaps this is because the particular agony of Tasmania is in the end neither environmental nor political but spiritual, and it is merely one end, one highly visible end, of a continuum that extends from the muddy ash of the Styx valley to the blood spattered walls of Baghdad and the torture cells of Guantanamo Bay. Could it be for this reason that in these paintings of clearfelled forest coupes, there can be divined images of torment and destruction of wider resonance? That in these charred man ferns and twisted regnant can be sensed not only the bodies of the slain of our new age of terror, but the guiding spirit of this age-the horrific consequence of having allowed ourselves to capitulate to lies promulgated by the powerful? You can daily read much about this world in the newspapers, follow its vicissitudes and horrors on a hundred cable news programs and a thousand radio broadcast and an infinite number of pod-casts. But if you wish to know the truth about our times, I doubt you could do little better than look at these extraordinary paintings. I don't mean to say that such grand ideas formed the ambition of this exhibition, which was conceived to deal with seemingly limited matters: landscapes, textures, shapes, form, composition. Painterly matters. But they do form its considerable achievement.